When you think of a butterfly what do you think of? A bug with big pretty wings? A monarch? A tattoo? At my current position as an AmeriCorps volunteer, I’ve had the great pleasure of learning about these fascinating creatures. We had some volunteers come to the park and spruce up our neglected, existing butterfly garden. It was decided that the butterfly garden needed a kiosk with butterfly information, and I got the lucky position of creating that information. I put a lot of research into the information, working closely with Dr. Leesa Sward, a park volunteer and college professor. Since working on the project I’ve developed a great fascination and appreciation for butterflies. To a lot of girls my age, a butterfly is a symbol. A symbol of beauty, metamorphosis, and carefreeness. To me, they are also a member of the order Lepidoptera, crucial pollinators of flowering plants, and food for birds and reptiles. I am amazed at the transformation they make from caterpillars to butterflies. Imagine growing a shell around yourself, losing your human form, and emerging as a bird. How does that happen? It’s science I know, but it’s magical that it even takes place. Perhaps that is why they are so fascinating to me, because they were once something else. 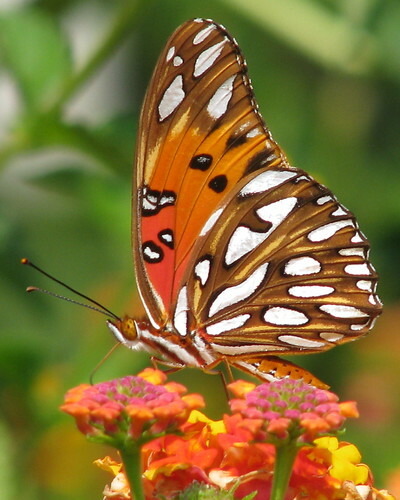 The little guy above is a Gulf Fritillary (Agraulis vanillae), a very common species in Florida. The larva of the species feed on passionflower plants, one of my favorite native plants. Prior to my butterfly introduction, I would have just seen this as one of many orange butterflies fluttering around the park, but now, I notice the bold patterns on the underside of the hind wings, the beautiful orange zebra stripes on the body, the cute little clubs at the end of the antennae (a good feature to distinguish it from a moth), the cute little upturned “snout” and the ever useful proboscis, feeding on the nectar of that Lantana plant. When I see a Gulf Fritillary now, I watch it fly around, taking note of the plants it feeds on, and wondering what kinds of flavors it picks up on it’s feet, and if I would ever be so lucky that it would land on me and tickle my hair follicles, bringing a smile to my face. By studying the details of something small and seemingly insignificant, I’ve learned to slow down. When I see a butterfly, a brief moment of zen passes over me as I get lost in observing the weightless journey it makes to and from each colorful, delectable bloom.